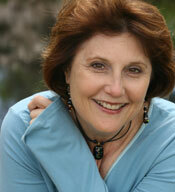 Patricia Alexander is co-author of The Book of Comforts: Simple, Powerful Ways to Comfort Your Spirit, Body and Soul. As an author and speaker, Patricia reveals how our coping mechanisms for stress often lead only to more stress, something she calls “toxic comforting,” such as overeating, over-spending and watching too many screens. Patricia’s passion is to reveal healthy ways that people can decrease their stress and increase their sense of well-being and balance. This comes through understanding what a priority it is to really comfort oneself consciously and effectively. An entertaining and motivating speaker, Patricia Alexander will regale your group with powerful and humorous stories while she imparts instantly useable techniques for real comforts – the kind that are meaningful and enduring to mind, body and spirit – and thus empowering to all we do. Patricia can tailor her presentations according to your needs. If desired, she can also include the participants in an interactive way that is stimulating and fulfilling. The seminars and keynote presentations vary in length between 1 and 1.5 hours, while the workshops are normally 3 to 4 hours. There is also a three-part workshop available that requires a two-to-three day or night commitment. The workshops provide participants with handouts, gift goodies, and a journal where they will personalize their own choices for healthy self-comforting, leaving with a plan and a commitment. Consciously or unconsciously, we’re all seeking comfort. Learn what’s really happening when you catch yourself eating more food than you want, having a third glass of wine you regret, watching too much TV, spending money you can’t afford, or zoning in front of the computer. Patricia Alexander will help you get back in touch with things that bring you real comfort and put those numbing, distracting and addicting behaviors back into moderation where they belong! Enrich your busy life with the gift of healthy self-comforting. Patricia will open three vital windows of knowledge that, once learned, will arm you with the magic in your life that makes the difference between overly stressed and overtly empowered. She will bring you practical, creative techniques that promote stress reduction while increasing your ability to appreciate the beauty, effectiveness and priority of real comfort. When we start practicing the art of “Reasonable Hedonism,” we learn how to experience full and passionate pleasure – without going to any unwise extremes. With a little humor and a lot of wisdom, Patricia shows us how, as we say “yes” to ourselves in this life-embracing way, we become freer to have the life we really want. Bad Habits or Toxic Comforting? Yourself (and Others) for a More Effective Life! Are you caught in a vicious cycle of feeling guilty for your own bad habits while feeling critical of others for theirs? Well, author Patricia says these aren’t bad habits – they’re toxic attempts to comfort oneself – and that people need comfort – they’re just looking for it in all the wrong places. Learn how to turn your inner and outer critic into a more empathetic and inspiring voice by learning how people can give themselves what they are really seeking – and then watch it bring balance and purpose to their lives. People who are focused on strong goals or who consider themselves to have a life’s mission can suffer from severe tunnel vision; the very thing that can make them fruitful can also make them exhausted. Learn how your goals will be empowered when you raise the priority on healthy self-comforting. Let’s make YOU a priority and start bringing a more balanced energy to your life and work. Patricia Alexander will teach you how to use yourself wisely instead of just using yourself up. Sometimes the best givers struggle the most with giving to themselves or receiving from others. The truth, however, is that only when a caregiver gives care to themselves first are they healthy enough to continue. Author Patricia Alexander will show you how to turn “burn-out” into “blossom-out” when you give yourself permission to comfort yourself with these simple and powerful techniques that make sure a giver has something left to give. How to Get Wiser, Not Older! Aging can be a scary thing, filled with changes to our bodies and our minds, even while our spirits and souls might be more peaceful than ever before. Draw back from fear and embrace the love and peace that comes with comforting yourself mindfully, purposefully and regularly. Patricia Alexander will show you ways to make sure that every new year brings more wisdom, not just more wrinkles! Knowing your Comfort Quotient (CQ) will enable you to give healthy self-comforting to yourself in just the right amount and just the right way. And when you do that, it will balance and empower your life as nothing else will! Why is it that we can comfort a loved one, or even a stranger, but tend to deny that same sincere flow of comfort to ourselves? Can we ever break free of that authority voice that holds us to a different standard? Patricia says we can and she can show us how. By giving ourselves permission to experiment with a new way of comforting ourselves, we will evolve into the person we were meant to be. If you feel at all wistful about any aspect of your unfulfilled creativity, whether it be your ability to write, do art, sing, dance or attempt anything creative, this is the workshop for you! Let Patricia release you from the judgment and “myth-truth’s” of what you think you can’t do and help you discover the comfort of what you just naturally are: a creative person without limitations. by Giving Yourself the Real Comfort You Need…Now! Has food become something you battle with instead of being one of the great pleasures of life? Or is it a pleasure followed by regret and self-criticism? Let Patricia show you, with humor and gentle empathy, what’s underneath our struggle with food, fitness and self-image. Patricia has recovered from being a fat child and teenager. She felt fat her whole life (even when she wasn’t) and did indeed gain 40 pounds in her forties. She lost that weight in 1999 and has kept it off. She will lead you into a revolutionary new way of thinking about food and fitness and will open your mind and your heart to explore ways to give yourself the comfort you are seeking in a way that is powerful and fulfilling – and not just filling! Author Patricia Alexander teaches you the power of infusing your life with healthy self-comforting techniques that are fun, practical and creative. Alexander shows you how mind, body and spirit make up the three rooms of your “house” – and that each room requires a different kind of attention, so that the house will stand strong and straight. NOTE: This workshop can assume various formats, including a day and a half or two or three night workshop or a three-part series of 4 hours each over three weeks. The more time allowed, the more material can be covered, and the more listeners/participants will take away with them.